Acne can be frustrating and confidence-lowering enough when it’s dotting your face, but some people also deal with acne breakouts on their body—with the neck, chest, and back often being hit the hardest. Even more confounding is that body acne for some unknown reason is also the most stubborn, taking what seems an inordinate amount of time to go away. There are definitely ways to get body acne under control, but only by following research-proven advice, not myths. We definitely don’t want you using poorly formulated products or causing more problems by not being gentle (which is often the last thing someone with acne thinks is how they should care for their skin). With our advice, you stand a very good chance of quickly seeing clearer, smoother, and more even-toned skin! Before we go any further, it’s important for you to know that the research about body acne makes it 100% clear that it doesn’t require different ingredients or formulas than what is needed to treat acne on the face. There are different types of pimples, yes, but when it comes to over-the-counter care, the same ingredients proven to be effective for the face are needed for your body. This is true whether you have acne on your neck, chest, or back. Cleanse skin gently—no soaps or bar cleansers! A gentle, water soluble cleanser is the first step toward improving skin. A fragrance-free body wash with no oils or emollients like shea butter is a very wise first step. Bar soaps and bar cleansers are rarely, if ever, non-irritating. They tend to be drying (which is not a good thing as you can’t dry up breakouts). Plus the ingredients that keep bar cleansers in their bar form can leave a skin-dulling residue that builds up, potentially making breakouts worse. Additionally, pure soap is alkaline in nature (skin is naturally acidic), which means it can be drying and gradually hurt skin’s surface (Indian Journal of Dermatology, September-October 2014). Exfoliate with a BHA product every day. A well formulated, leave-on, completely non-abrasive BHA exfoliant is a significant game-changer for body acne! BHA is also known as beta hydroxy acid and on the active ingredient label as salicylic acid It works to unclog pores, balance the flow of oil through your pores, and temper redness, all of which can send body acne on its way faster than you’d expect. You can use an anti-acne BHA exfoliant in liquid form, applied with a cotton pad, or, for hard-to-reach areas, a spray-on BHA exfoliant that can be held in any direction (including upside down) is perfect! 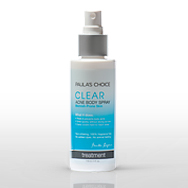 For easy to reach areas, our Paula’s Choice CLEAR Anti-Redness Exfoliating Solution will work great but if you have "bacne" Paula’s Choice alcohol- and oil-free CLEAR Acne Body Spray is a must. Both are formulated to exfoliate to clear pores deeply, even skin prone to cystic acne. Use the gold standard acne-fighting ingredient, benzoyl peroxide. Benzoyl peroxide is an extremely effective anti-acne ingredient. For best results when applying to larger areas, look for products that contain 2.5-5% benzoyl peroxide in a lightweight, gentle, fast absorbing lotion base, such as our Paula’s Choice CLEAR Daily Skin Clearing Treatment. It is exceptionally effective when used in the long term all over acne-prone areas. Avoid using it as a spot treatment as it is best when used tactically and not just when eruptions occur. Don’t forget the sunscreen! Sun damage magnifies substances within skin’s surface that can make the appearance of acne worse and extend its stay on your skin—no thanks! That’s why protecting exposed body skin every day with a broad spectrum sunscreen rated SPF 30 or greater is so important. Doing so will help skin recover in numerous ways, not to mention look younger, longer. Worried that sunscreen will feel too heavy or slick on your body? We can’t say we blame you—many sunscreens don’t feel great—but there are lots that do, including our Paula’s Choice Extra Care Non-Greasy Sunscreen SPF 50, a fluid, antioxidant-rich formula that shields without slickness or shine. Your hair conditioner: The emollient formulas many conditioners have, if not rinsed thoroughly, can cause clogged pores on the back, neck, and chest. Be sure to rinse conditioner well, and then wash any residue from skin by cleansing your body as the last step in your shower routine. Your workout. As soon as you’ve finished your exercise routine, hop in the shower and use a gentle body cleanser. Sweat on skin’s surface mixed with oil and skintight workout clothes creates an ideal environment for breakouts—so cleansing as soon as possible after you’ve exercised lowers the risk of body acne. Your body scrub or loofah. No, scrubs and loofahs don’t cause body acne as they don’t harbor what triggers acne but what you need to know is that acne cannot be scrubbed or buffed away! Instead, the abrasive action of these products can make existing breakouts look redder and take longer to go away, even if you’re also using the best anti-acne products. Should you worry about your bed sheets? Some people are concerned that if they don’t change their bed sheets often that acne-causing bacteria will build up on them, leading to more breakouts while you sleep. We understand the thinking here, but that’s not how it works. Acne-causing bacteria doesn’t live in air so it isn’t possible for it to stay alive on your sheets and then cause acne. Of course, you should wash your sheets for routine hygiene but doing so because you’re worried about more body acne isn’t necessary! By following the tips above and avoiding the habits that only make breakouts worse, you’ll be on your way to clear, smooth, even-toned skin you’ll want to show off on the front and back of you!